New Jersey's average precipitation annually averages around 45 to 47 inches, with about half of the water evaporating or used by plants for growth and cooling. Generally, the lowest precipitation levels are in the Atlantic-Cape May area and the highest in Sussex-Warren region. August of 2011 was the wettest month in New Jersey since at least 1895--surpassing the previous monthly record for rainfall by nearly 40%. The remaining water from precipitation after evaporation amounts to about one trillion gallons, roughly equivalent to the state's annual water usage through consumption of potable supplies and agricultural, industrial and commercial operations. Of water withdrawn for all uses, about three-quarters comes from surface water in rivers and reservoirs. 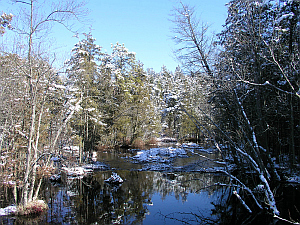 Underground water sources include the Kirkwood-Cohansey Aquifer in the Pinelands, which contains an estimated 17 trillion gallons of water and provides drinking water for one million people in the region. Domestic wells account for only about 3% of consumption. The two leading uses are for potable water supply for public consumption and for utility power generation. According to the most recent state data, withdrawals for agricultural and industrial use has declined or remained static since 1990. 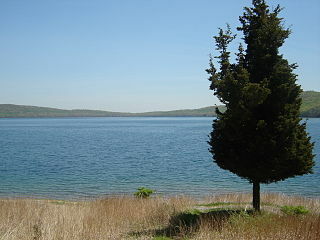 The use of New Jersey's water supplies are also limited by pollution. The Passaic River, for example, is considered one of the most polluted in the nation, largely as a result of the waste deposited by industries along the river commencing in the nineteenth century. In April 2014, the US Environmental Protection Agency announced a $1.7 billion plan to remove 4.3 million cubic yards of toxic mud from the bottom of the lower eight miles of the river, a project which will be one of the largest clean-ups ever undertaken by the EPA. The state Water Supply Master Plan was developed pursuant to legislation enacted in 1981 and in the same year voters approved issuance of $350 million in bonds to finance expansion and improvements to water supply infrastructure. The legislation and bond program followed the controversial decision of Governor Brendan Byrne not to construct the proposed Tocks Island Dam on the Delaware River at the Delaware Water Gap, which its proponents argued would ensure the state's long-term supply needs by creating a massive lake and reservoir. In the absence of the Dam, Governor Byrne initiated planning and development of smaller reservoirs and a network of pipelines to meet future water supply needs. Pursuant to the Plan, the state subsequently built or expanded reservoirs and pipelines to increase the connectivity of water storage facilities to transfer water to regions impacted by drought. The most recent update to the Plan was issued in 1996 during the Christine Todd Whitman administration, and the state Department of Environmental Protection has been criticized for the failure to release a new revision. In 2013, a blue-ribbon panel identified up to $8 billion in unmet needs to upgrade aging drinking water infrastructure, which contributes to an estimated 20% of the state’s drinking water supply being lost before it reaches consumers. Large sections of major rivers of the state, including the Passaic, Raritan, Hackensack and Delaware, became polluted as a result of industrial discharges directly into their waterways or through seepage from ground waters of nearby dumps and landfills. In 1990, the state enacted the Clean Water Enforcement Act, one of the strongest clean water laws in the country at the time creating mandatory minimum fines on polluters. The legislation also authorized the DEP to establish different levels of standards to prevent pollution, with its strongest designation creating a buffer zone within which development was barred and all discharges prohibited that would measurably degrade water quality. The Clean Water Act, which went beyond the enforcement measures of the federal Clean Water Act, followed a series of controversies over toxic pollution of groundwater in the 1970s and 1980s, including that in the Toms River area from the former Ciba-Geigy chemical plant and chromium pollution resulting from materials deposited at several sites in North Jersey, including that at the former DuPont pigment plant in the Ironbound section of Newark.